Laura Nsengiyumva participated at Coup de Ville 2013. This text was published in the catalogue. In 2012, the video-installation ‘1994’ (see image on left page) by Laura Nsengiyumva was awarded the runner-up prize at the Dak’Art exhibition, the Dakar Biennale Exposition in Senegal. It is a frontal portrait: a young family from Ruwanda, arrivals in Belgium, are sitting on a couch watching TV at the time of the genocide. The viewer stares at the family from the same couch. “I’m starting from something personal to arrive at something with a broader compass. In this manner, I want to bring a message about the multitude of identities that are all part of society, so that people may come to realise that, in fact, all identities are multiple ones.” Hence, the work takes you and me for its subjects. 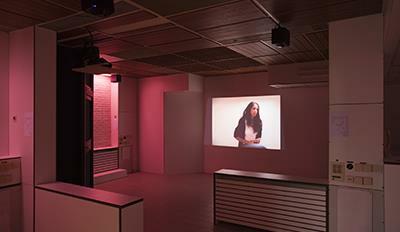 ‘Helen’, also a portrait, is a video and audio installation set inside a former section of the Sint-Niklaas hospital complex. The artist labels the composition of speakers and imagery as a ‘sonorous cartography’. 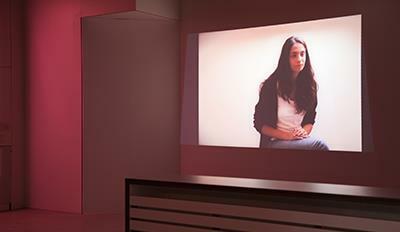 On the screen, the visitor notices a young white woman talking in a very expressive manner. What is she saying? Her voice is dubbed by black European women in African languages as spoken in Belgium, in the way an American television soap is being dubbed in multiple countries. Whoever does not grasp the meaning of the words becomes conscious of the feeling of exclusion, but is also made aware of the richness of African languages. In an emotion-filled symphony, black women display their voice, temperament and identity. They laugh, they weep, all at the same time, together with actress Hélène Chalastanis who uninhibitedly and honestly discusses her love life. This tower of Babel does not make people disperse but rather draws them together. This is a multi-layered installation. It connects with women’s portraits in the history of art, from Michelangelo’s ‘Pietà’ to Picasso’s ‘Les Demoiselles d’Avignon’. It emits a murmured explanation of sorts concerning the so-called futility of women’s business which Virginia Woolf wrote about in 1929. It tweets about North-South relations. In ‘sisterhood’ Laura Nsengiyumva also discovers an ironic response to the pronouncement of the Senegalese poet and statesman Léopold Senghor: “L’émotion est nègre et la raison est hellène” (“The emotion is black and the reason is Hellenic”).